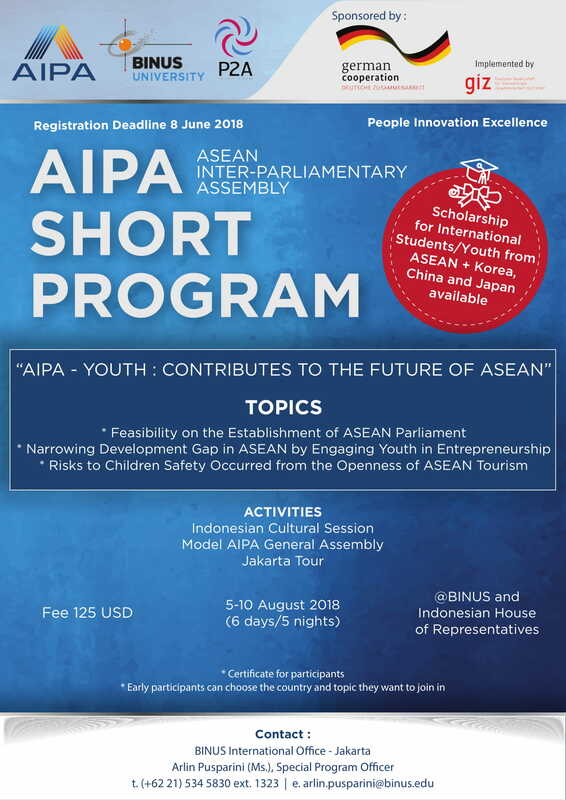 We would like to re-announce the opportunity of Short Program “AIPA – YOUTH : Contributes to the future of ASEAN”. AIPA stands for ASEAN Inter-Parliamentary Assembly. It serves as the center of communication and information among Member Parliaments which consist of Brunei Darussalam, Cambodia, Indonesia, Lao People’s Democratic Republic, Malaysia, Myanmar, Philippines, Singapore, Thailand, and Vietnam. AIPA aims to encourage understanding, cooperation, and close relations among Member Parliaments as well as Observer Member Parliaments and other parliamentary organizations. AIPA also plays instrumental role in familiarizing the peoples of Southeast Asia with policies aimed at accelerating the realization of an ASEAN Community in 2015. Together, we consider that its crucial to bring youth of ASEAN in a diplomatic table to exercise their skills on diplomacy through AIPA General Assembly Model. The topics will be presented : Feasibility on Establishment ASEAN Parliament, Narrowing Development Gap in ASEAN by Engaging Youth in Entrepreneurship, and Risks to Safety Occurred from the Openness of Asian Tourism. This program is also supported by GIZ as a provider of international cooperation services for sustainable development and international education work, we are dedicated to building a future worth living around the world with The German Federal Ministry for Economic Cooperation and Development (BMZ) is their main commissioning party. The program will take place on 5-10 August 2018. The deadline of registration in on June 8. Looking forward for the participation of your students as part community in ASEAN to develop and strengthen the region and as well to contribute globally.